Sir Charles Villiers Stanford was one of the principal figures of the English musical revival during the later years of the reign of Queen Victoria, although the religious music featured on these fine recordings forms only a small part of Stanford’s prolific output. The other three composers featured, although more minor musical figures, share in a common heritage: Tertius (Thomas) Noble studied with Stanford, while Noble, Sir Edward Bairstow and Francis Jackson each held the post of organist at York Minster, between them spanning the years 1892 to 1982. 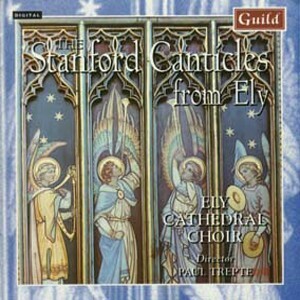 These jewels of English Church Music are performed in the remarkable Cathedral of Ely, which possesses the finest 12th century facade in the United Kingdom, all the more remarkable for being perched on an island in what was then the swamp of the Fens.